" vbWatchdog is off the chart. It solves a long standing problem of how to consolidate error handling into one global location and avoid repetitious code within applications. " 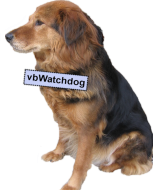 vbWatchdog: A unique code library offering global error catching for your VBA & VB6 projects. Get emails out to your customers reliably, and without hassle, every single time. Use vbMAPI alongside Microsoft Outlook to add professional emailing capabilities to your projects. vbMAPI: An easy-to-use Outlook / MAPI code library for VBA, .NET and C# projects. Standard compilation to MDE/ACCDE format is flawed and reversible. 'strSource is the source file name. strTarget is the target file name. 'A disk and path may be included, but you cannot omit the name of the file. strMsg = strSource & " not available"
strMsg = "Cannot open the destination. Did you specify the full name? Does a read-only file with that name exist?" strMsg = "Invalid file name"
strMsg = "An unknown error occured"
Have your say - comment on this article. What did you think of 'Copying a file in Access v2'? Why not be the first to comment on this article?! Comments require approval before being displayed on this page (allow 24 hours).